Thus, Been There Pike Place Market was indeed planned for March 27 and so it happened. An interesting detail about this one – the box is not blue as for other BTs, but orange. 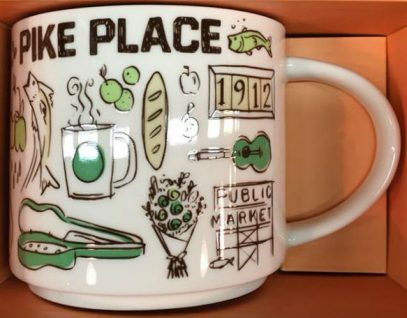 This is probably what Starbucks meant by “exclusive mug”. Thanks Jean-Paul, I saw your post and forgot to mention your findings. 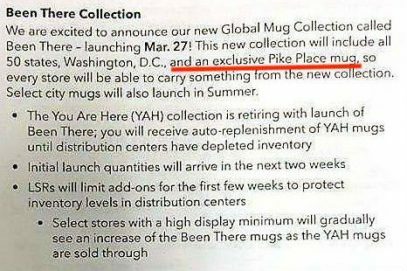 I’m also super curious about the “pin point collection” anyone know of other locations that are included in the pin point location subset of the Been There series? There are no new rumors about “pin point collection”, however we can expect new releases in the future. Scott, I am sure they are selling the remaining stock of US ornaments and that’s it.